Low-profile, single-plane Victor Jr. intake manifolds from Edelbrock are very versatile and can be used for drag racing and Oval Track competition, as well as for street applications. Power bands range from 3,500 to 7,000 rpm, on up to 4,500 to 8,000 rpm. 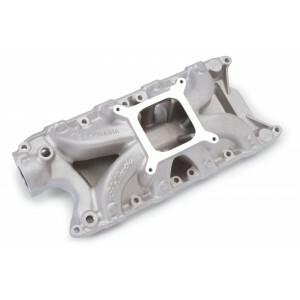 There are applications for small block and big block engines, as well as for 2-barrel and 4-barrel carburetors. Some manifolds accept standard restrictor plates and carb adapters. Victor Jr. #2921 has bosses for rear water crossover. Port exit size at cylinder head is 1.08" x 1.90" with enough extra material to open it up to 1.18" x 2.10"